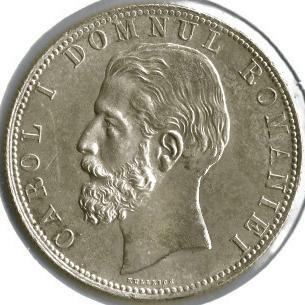 denomination "5 L", ROMANIA, year 1880, Romanian coat of arms, letter B and wheat ear, the signs of Romanian mint, outer pearl circle inscription "CAROL I DOMNUL ROMANIEI" meaning "PRINCE OF ROMANIA" and CAROL I head facing left. 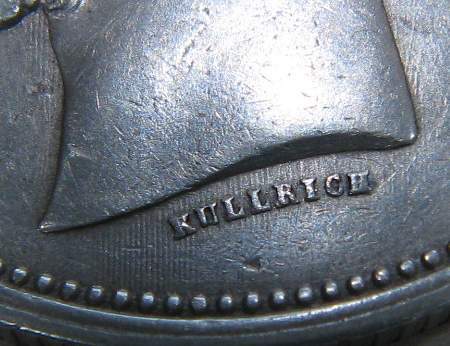 Along the outer pearl circle lies KULLRICH, the engraver's name. 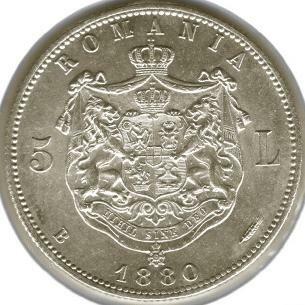 The silver 5 lei 1880 coin pictures above are present on Romanian coins through the kind permission of Mr. Radu Lissner. The 5 lei coin struck in 1880 has two variants. As shown in the pictures below, the name of the engraver appears either right below the neck or along the pearl circle. The second one is slightly rarer and is the only of all variants with Kullrich appearing this way. 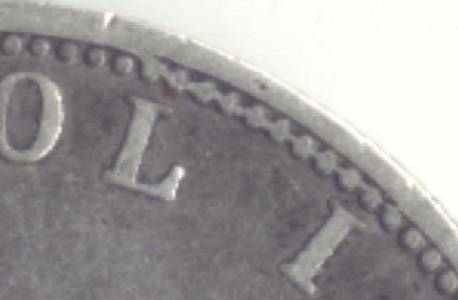 We feature below a detail of a 5 lei of 1881 revealing a very interesting error. Eleven pearls (starting with letter L in CAROL, clockwise) are joined together. 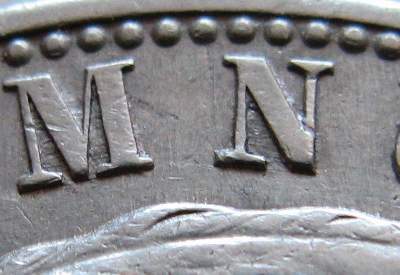 The surplus metal came from the coin edge, as result of a die flaw. The information reguarding this error as well as the explanatory picture were provided for Romanian coins by Mr. Adrian Popovici. He also sent us the images (below) of a fake 5 lei 1881 coin made from lead. Premiere: 5 lei 1881 (DOMN) with "wrinkles". Similar to 100 lei 1943 there is a newly dicovered variant, nobody knew about. Being more spectacular than the one with Mihai, it shows approximately the same type of notches on the die (that appears on the coin as proeminences). 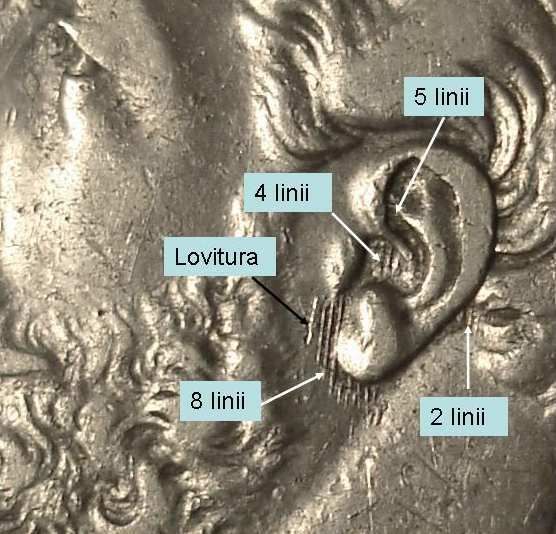 Unusual is the fact that the "wrinkles" appear in the ear, in the deepest zone of the coin. There are 4 hachured zones, 3 of them with parallel lines almost vertical, and the 4th with lines perpendicular to the others. 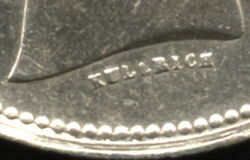 The ulterior adding of lines on the coin is excluded and also the provenance from a struck error. Mr. Florin Lazar sent us the 5 lei 1880 pictures and information presented below. 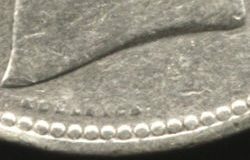 The coin has an interesting feature: there are many parallel lines on the flat surface of the field. The lines are more obvious in the regions that are very close to the effigy and to the legend.